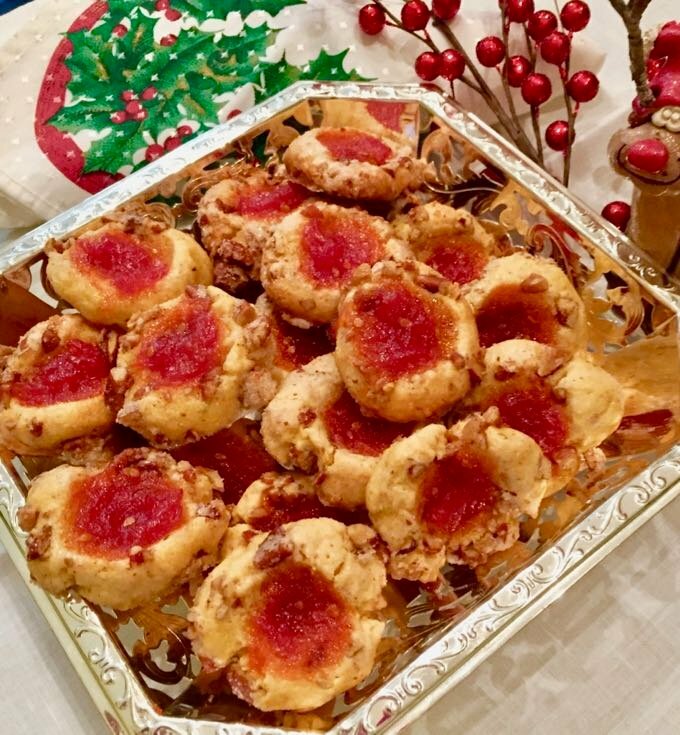 Sweet, savory, and crunchy Cornmeal Cookies with Tomato Jam are the perfect Christmas and holiday appetizer, and this Southern treat is an exceptional substitute for the usual chips and dip party fare. These unique Christmas cookies also freeze well, and they are great to have on hand in the freezer to serve to unexpected guests. They also make a wonderful homemade food gift for friends and family! 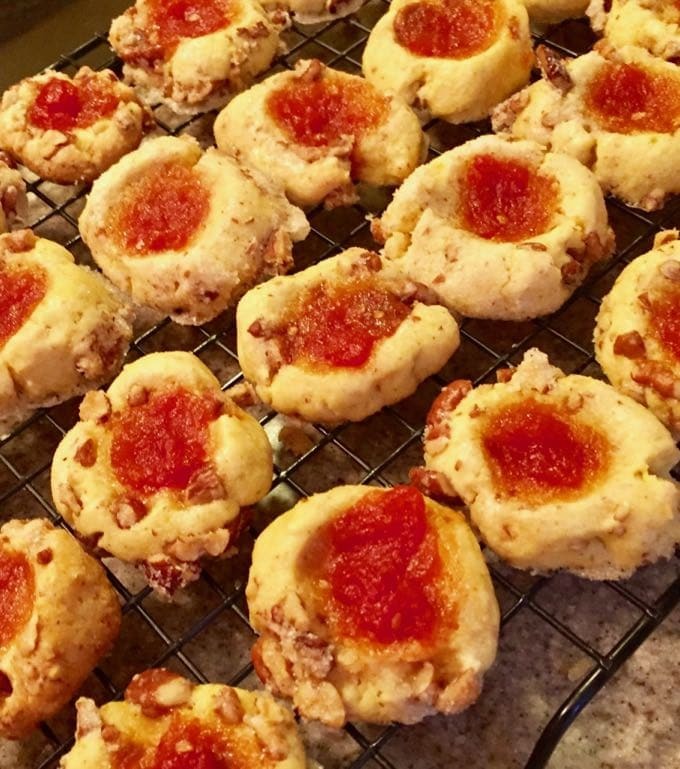 I saw these cookies several years ago in a Southern Living Magazine and every time I make them I have been asked for the recipe. 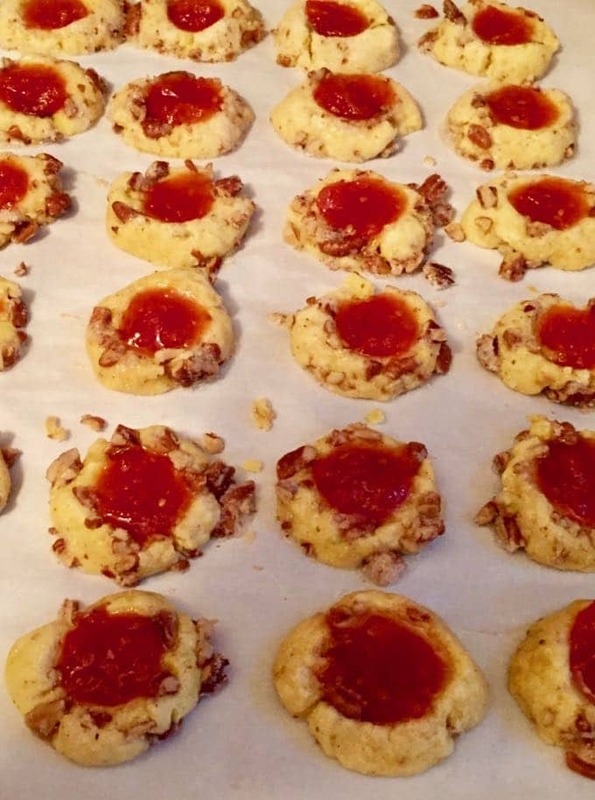 If this recipe for Cornmeal Cookies with Tomato Jam has a downside, it’s only that they take a little more time than usual to make. 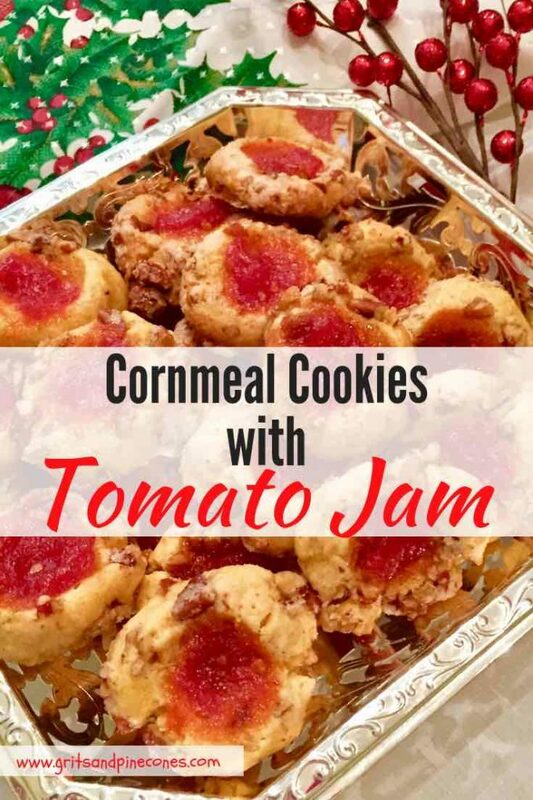 I usually make the tomato jam and cookie dough one day and bake the cookies the next. Tomato Jam is both savory and sweet with hints of orange zest, cloves, and ginger. And, it’s the crowning glory in this cornmeal cookie studded with bits of pecans. Plus, the best part, you won’t believe how easy my tomato jam recipe is to make! Tomato jam is also fabulous on biscuits, BLTs, burgers or grilled cheese sandwiches. It’s even great as a glaze on chicken, pork or meatloaf. 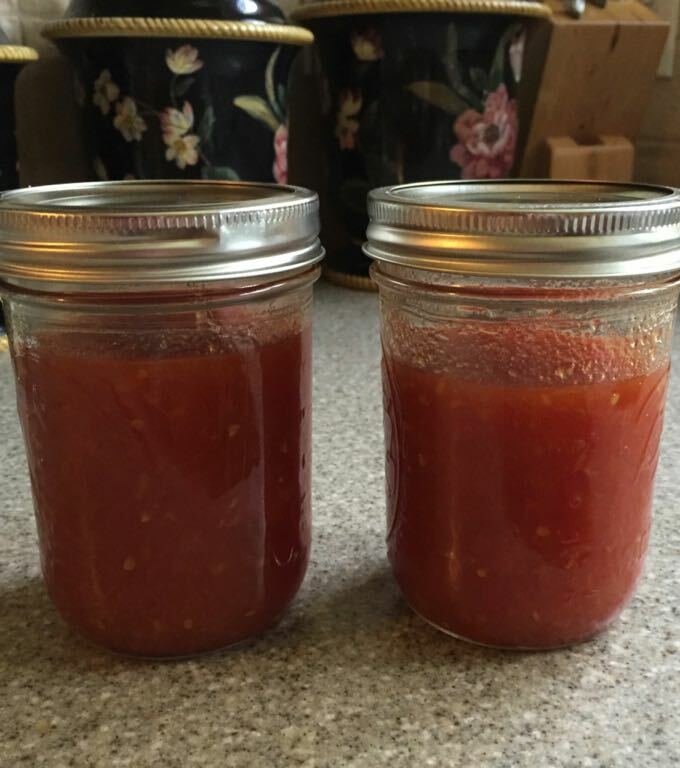 This easy tomato jam recipe makes 2 cups, so there is plenty of leftover jam for other culinary creations or another batch of cookies. 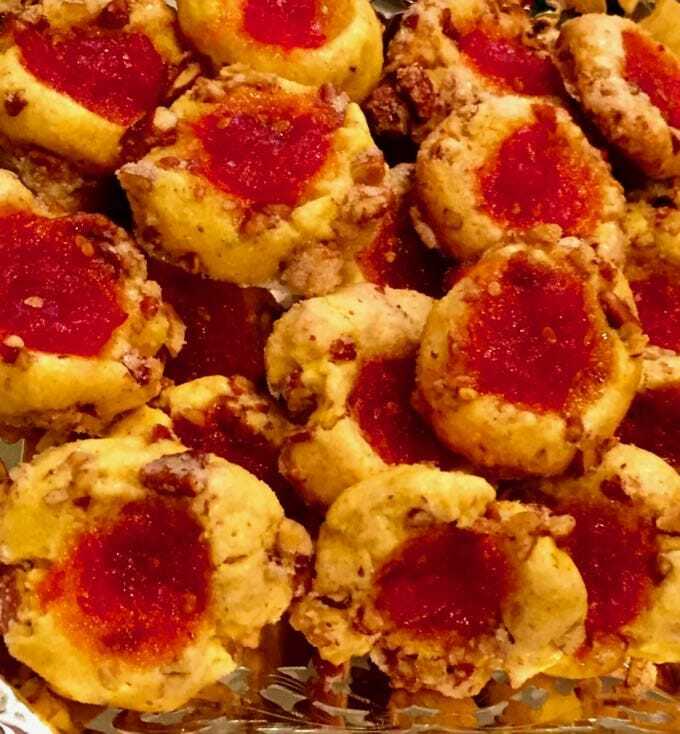 If you are looking for other fabulous holiday appetizer recipes, you might want to check these out: Quick and Easy Stovetop Candied Pecans, Hot and Cheesy Baked Shrimp Scampi Dip, and Crispy Cheesy Southern Cheese Crackers. Need more ideas, check out all of my appetizer recipes here. To make this recipe for easy homemade tomato jam, gather your ingredients which are: tomatoes, sugar, apple cider vinegar, orange zest and juice, ginger, salt, coriander, and whole cloves. You will need 3-4 fresh tomatoes, which are about 1 1/2 pounds depending on the size of your tomatoes. To easily peel your tomatoes, bring water to boil in a large pot or dutch oven. Add whole tomatoes and boil for 1 minute to loosen skins. Drain and put the tomatoes in ice-cold water to stop the cooking process. Once the tomatoes are cool, the skins will come right off. Remove the core and chop the tomato into small pieces. 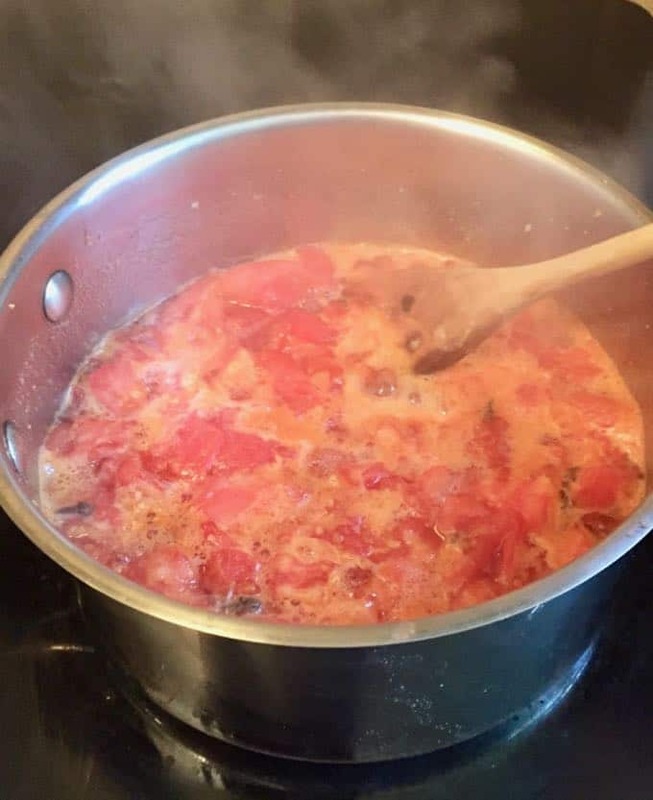 Remove the tomato mixture from the heat and discard the cloves. Mash the tomatoes using a potato masher, or use your immersion blender to get the jam to your desired consistency. I prefer small chunks of tomato in my jam, so I use a potato masher. Cool the tomato jam 20 minutes, and store in a refrigerator in an airtight container for up to 1 month. Mason jars are ideal. 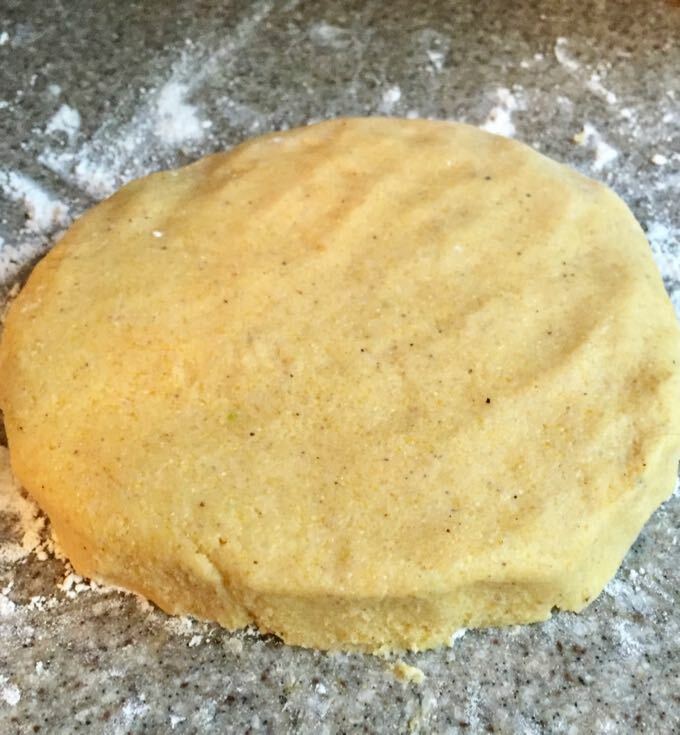 These cornmeal cookies have a long list of ingredients, but don’t let this deter you. If you bake at all, you probably already have everything in your pantry. 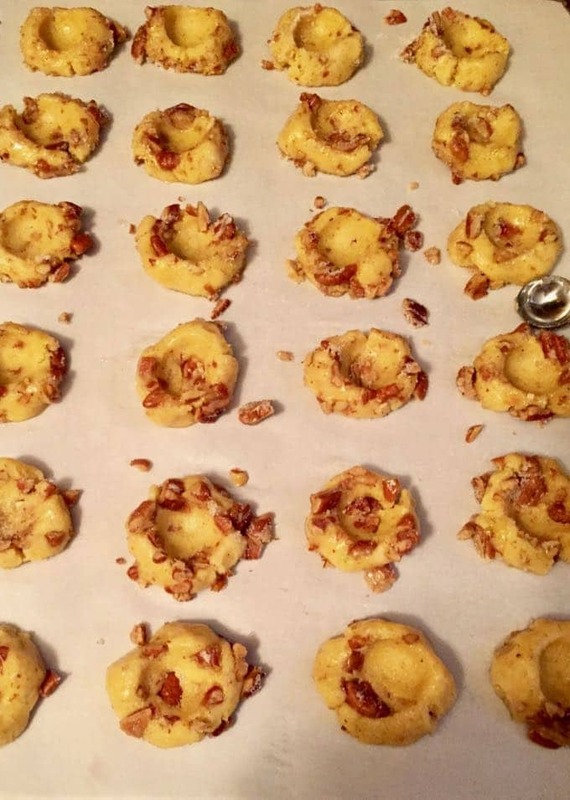 The ingredients are butter, powdered sugar, an egg, vanilla extract, all-purpose flour, plain yellow cornmeal, lemon zest, salt, nutmeg, toasted chopped pecans, and granulated sugar. You will also need parchment paper and a cookie sheet. In an electric mixer with a paddle attachment, beat the butter and powdered sugar at medium speed 2-3 minutes, or until light and fluffy. Crack and separate the egg and add the yolk (reserve the egg white) and vanilla, beating until well mixed. 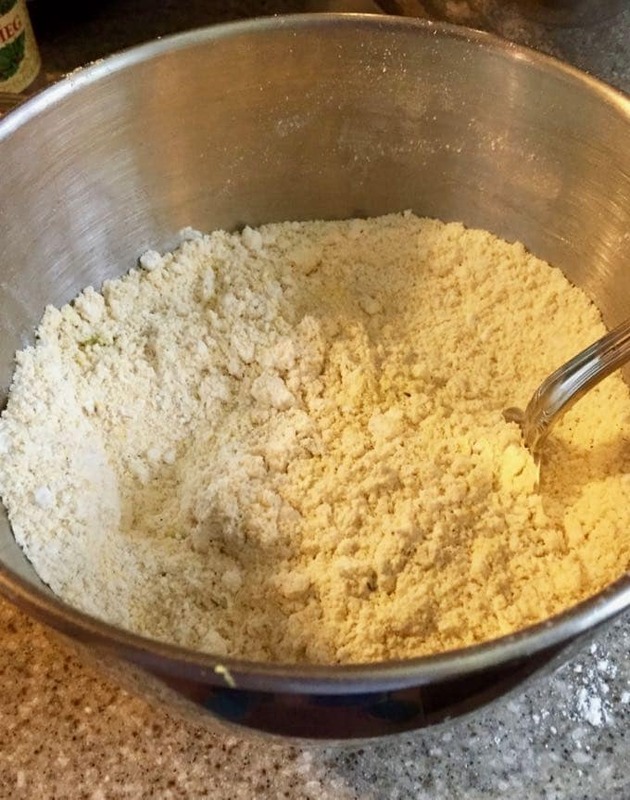 Stir together the flour, cornmeal, lemon zest, salt and ground nutmeg in a small bowl. 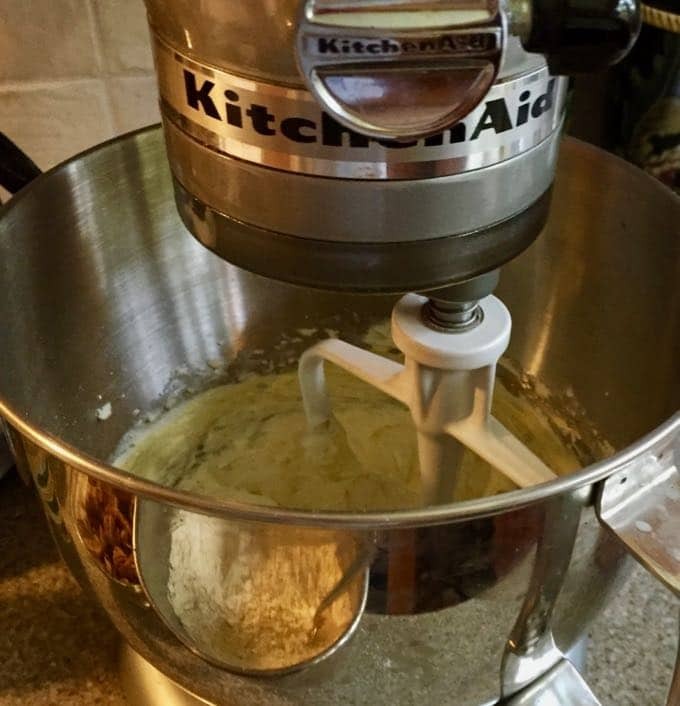 With the mixer on low gradually add the flour mixture to the butter mixture, beating well each addition until well blended. Turn the dough out onto a lightly floured surface and knead 3-4 times. Shape the dough into a 1-inch thick flat disk. 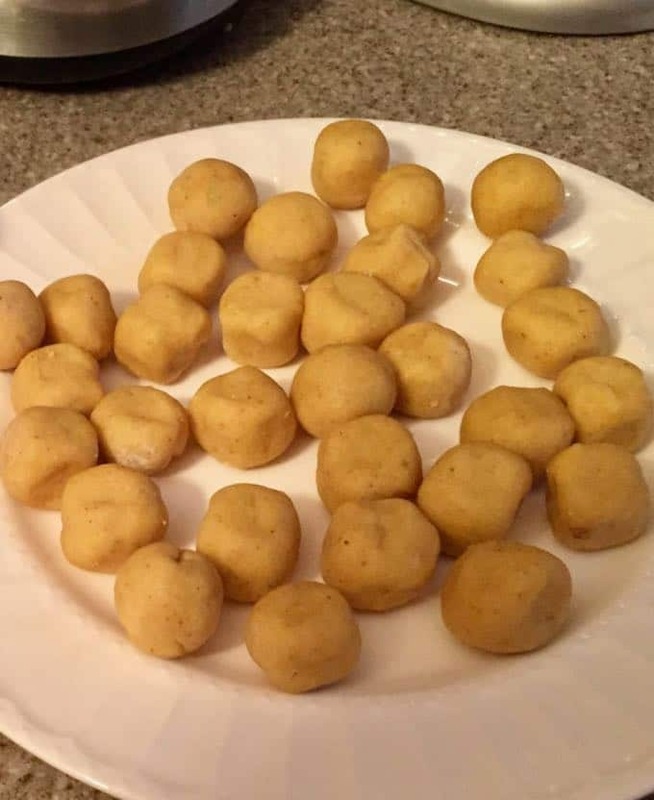 When the dough is thoroughly chilled, cut it into 1-inch cubes and roll into small balls. Stir together finely chopped toasted pecans and granulated sugar. Lightly beat the reserved egg white and add about 1/2 tsp of water. 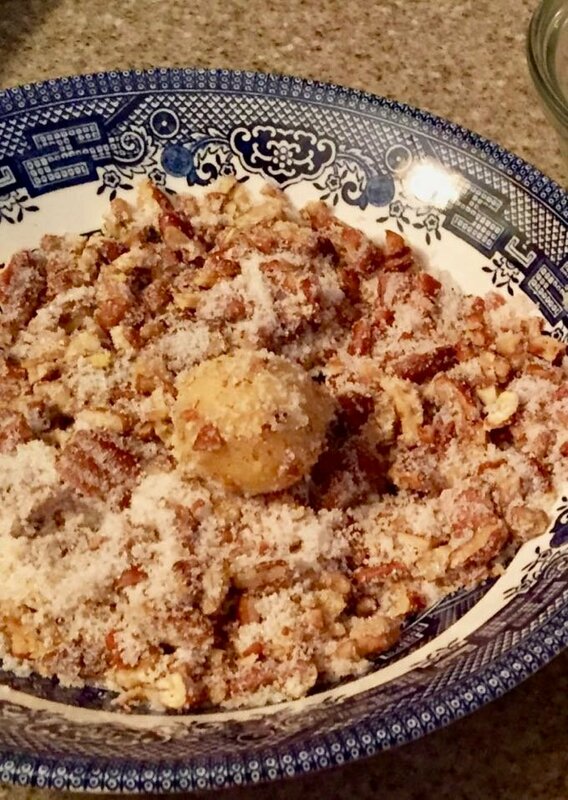 Dip each cookie dough ball into the egg white and then dredge in pecan/sugar mixture. If necessary press the pecan mixture into the cookie dough ball. Place the cookies on a parchment lined cookie sheet. Using a 1/2 tsp metal measuring spoon, make an indention in each ball. Bake the cookies for 10 minutes. Remove from the oven and using your 1/2 tsp metal measuring spoon press the indention again. Spoon 1/2 tsp of tomato jam in each indention and bake 10 minutes more, or until golden brown. Cool on baking sheet for 5 minutes, then place on a wire rack to cool completely. 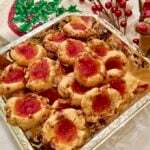 *This recipe for Cornmeal Cookies with Tomato Jam was first published December 2, 2015. Republished on November 24, 2018, with updated pictures and simplified directions. No change to the original recipe. Bring a large pot of water to boil over high heat. Add tomatoes, and boil 1 minute. Drain and put tomatoes in a large bowl of ice cold water. Once cool, peel tomatoes. Then cut core out and chop them into small pieces. Add tomatoes to medium size saucepan along with sugar, apple cider vinegar, orange zest, orange juice, grated ginger, salt, ground coriander and 5 whole cloves. Remove from heat and remove cloves. Using a potato masher, mash the tomatoes to a jam like consistency. Cool 25 minutes and refrigerate in an airtight container for up to 1 month. In a separate bowl stir together flour, cornmeal, lemon zest, salt and nutmeg. Add to butter mixture a tablespoon at a time, mixing well after each addition. Turn dough out onto a lightly floured surface and kneed 3-4 times. Shape dough into 1 inch disk. Wrap tightly in plastic wrap and chill a minimum of 2 hours. (At this point, dough can be stored in the refrigerator for several days until ready to use. Preheat oven to 350 degrees. Stir together finely chopped toasted pecans and sugar in a small bowl. Lightly beat the reserved egg white and add 1/2 tsp of water. Mix well. Cut dough disk into 1 inch cubes and roll between your hands to form a ball. Dip each ball in the egg wash, then roll in pecan mixture lightly pressing the mixture onto the balls. Place 1 inch apart on a parchment lined cookie sheet. Using 1/2 tsp metal measuring spoon, press each ball creating an indention. Bake at 350 degrees for 10 minutes. Remove from oven, and using your measuring spoon, press the indention again, being careful not to press too hard and create a hole in your cookie. Add 1/2 tsp of the tomato jam to each indention. Bake for an additional 10 minutes, or until lightly browned. Cool 5 minutes and transfer to a wire rack to continue cooling. Store in an airtight container for up to 4 days, or wrap well and freeze for up to a month.